A few months after taking over my new position as the World Bank’s vice-president for the South Asia region, I spent a few days and nights with Bhavnaben and her young family of salt workers on the edge of the desert in the Little Rann of Kutch in Gujarat. Since that time, Bhavnaben has been my touchstone of progress in India’s booming economy, and I return every year to visit them. I go to see first-hand the life of India’s poorest citizens, to learn about their hopes and dreams, and to trace changes in their lives amid India’s rising prosperity. But escaping the clutches of poverty is never easy. Little did I realize how vulnerable the poor are to exploitation from those who wield power over them. Now that the family farmed two pans, the water vendor who supplied drinking water while they camped in the desert had doubled his charges! As the sole seller of a vital commodity —albeit of dubious quality—he charged whatever he pleased. In this case, he based his charges on the number of salt pans they owned instead of the amount of drinking water they bought! Frustrated that others were benefiting from his hard labour, Mangabhai, Bhavnaben’s husband, said he didn’t see any incentive to expand his salt business further. The cost of diesel—their major expense—had also gone up, while the price of salt had remained the same. In Ahmedabad, the state’s major city, I had heard talk about introducing solar or wind power on the salt flats since both have good potential in the desert. But I saw no evidence of anything being installed, so far. One encouraging sign was that the family had begun to diversify their sources of income to reduce their dependence on their backbreaking ancestral occupation. They had set up a small shop selling basic supplies to others on the pans. The shop—looked after by the oldest son—also sold flour, which they now ground themselves using a new machine. In addition, they had begun to produce industrial salt which fetched a much higher price than the consumption salt they produced earlier. And the older children—none of whom went to school when I first met them—were now in school. They had learnt to read the vernacular alphabet and rattled off the names of plants and animals pinned up along the walls of the makeshift tent that served as their classroom. Things were looking up, I thought. On my third and most recent visit in October, the family had made further efforts to improve their livelihood. They had leased a small piece of farm land from a relative for five years. On this, they had grown their staple food of millet and lentils. This was wise as it would reduce their expenses on food and ensure that the family’s granary was full for the coming year. But Bhavnaben seemed worried; unless the family could increase their income, she might be forced to get her eldest daughter, 14-year-old Chandrika, married off. The incentive would be the dowry they would receive from the bridegroom’s family (the Agaria tribe follows a system of reverse dowry). My most recent visit to the family reminded me of the many pitfalls in the climb out of poverty. Chandrika had been pulled out of school to look after the household so that Bhavnaben could spend more time at work alongside her husband. The eldest son’s schooling had also been cut short; he was needed to man the shop. Although the three younger children were still in school, how much they were actually learning was another question. 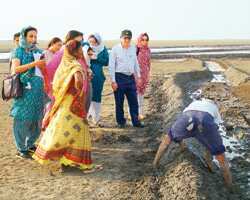 I strongly suspected that Kumar, the second son, was being taken out to work on the salt pans. All parents dream of giving their children a better future. But poor families’ inability to cope without their children’s labour invariably compromises the one thing that can make a real difference—education. The question continues to nag me: Will Bhavnaben’s children ever be able to avail of the new opportunities provided by India’s booming economy? Health services also remain a huge problem, causing many poor people to slip back into poverty despite their best efforts. An illness means the loss of precious work days, and a consequent set-back in income. Medical care is not easy to come by, local doctors are not particularly qualified, and it is both expensive and time-consuming to go to the bigger towns for attention. Bhavnaben had been unable to access any decent medical services for her son, Kumar, who had apparently been suffering from a series of illnesses for the past several years. What, then, can their future hold? When I tried to talk to Mangabhai about his financial planning for the time he can no longer work, he looked at me with glazed eyes. He had absolutely no idea. “The poor don’t have the luxury of looking into the future," Bhavnaben said. Standing next to Bhavnaben I feel small—her ability to cope under extreme conditions is remarkable. There is also an enormous dignity, both within the family and the community. They display great respect for each other and share what little they have with a disarming openness. Yet, they are subjected to a lot of indignity, mostly by outsiders who look down upon them and treat them as fodder for exploitation. All in all, I came away feeling that although things were looking better, life was still very tough for Bhavnaben and her family, and progress on the ground was painfully slow. Yet, I am optimistic, led by the family’s own tremendous resilience and willingness to improve its condition bit by bit. But this process must be helped and speeded up if growth with inclusion is to be the goal of India’s remarkable advancement. What will it take to provide new and more lucrative employment opportunities, the right kind of service delivery in health, education and infrastructure, better access to markets and finance, and the right kind of safety nets for families such as Bhavnaben’s to escape deprivation and poverty? Given the right kind of support in terms of health, education and training for a life outside the gruelling salt pans, families such as Bhavnaben’s can indeed escape the only life they have ever known —a life of constant deprivation and untold poverty.